Anaïs Nin (February 1903 – January 14, 1977) was a French-American novelist whose books were published into movies, including Henry & June (1990). She was born in Neuilly-sur-Seine, Paris. Her parents were from Cuba. Her father Joaquín Nin was a well-known composer. Her mother Rosa Culmell was a classical singer. She spent her early years in Spain and Cuba and then lived in Paris. In Paris she became a close friend of the writer Henry Miller. She helped him get his first novel, Tropic of Cancer, published and wrote the preface to it. She later moved to the United States and died there of cancer in Los Angeles. ↑ Encyclopædia Britannica (2018). "Anaïs Nin". Retrieved 25 July 2018. ↑ Campbell, James (1 June 2016). "Miller’s fail". The Times Literary Supplement. Retrieved 25 July 2018. ↑ Doyle, Sady (7 April 2015). "Before Lena Dunham, there was Anaïs Nin – now patron saint of social media". The Guardian. Retrieved 25 July 2018. ↑ Fraser, C. Gerald (16 January 1977). 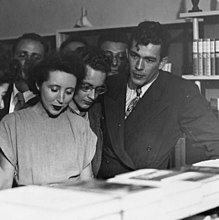 "Anais Nin, Author Whose Diaries Depicted Intellectual Life, Dead". New York Times, p. 28. Retrieved 25 July 2018. This page was last changed on 25 July 2018, at 11:53.